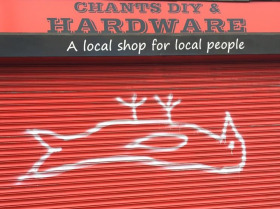 The owner of Chanterlands DIY and Hardware in Hull has decided to recreate the famous Hull Dead Bod icon on the shutters of his shop as part of a scheme to tidy up the local area. Owner Gary Clarke said he originally went looking for an artist to recreate the Dead Bod image, but in the end decided to take on the project himself, in the spirit of DIY. The image of the dead bird was originally painted on the Humber side of an iron shed at Alexandra Dock in the 1960s by Captain Len 'Pongo' Rood and Chief Engineer Gordon Mason. The image became a local landmark symbolising the city's fishing heritage, and, following a public campaign, was recently restored to become the centrepiece of the new Humber Street Gallery after plans to demolish the shed was revealed. Shop owner Gary Clarke said he recreated the image on his scarlet shutters to show support for its heritage. Speaking to local press, he said, “I think it's a great story of Dead Bod and it's very, very Hull. If you're from Hull you know what Dead Bod is and I'm a Hull man.